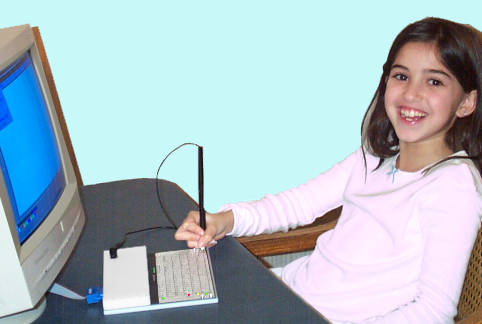 The Magic Wand Keyboard is a miniature computer keyboard, with a built-in mouse, that allows anyone with a disability to fully and easily access any computer. It is designed to be used with little or no hand movement and is the only computer keyboard and mouse that requires no strength. This mini computer keyboard works with the lightest touch of a wand (either hand-held or a mouthstick). It requires absolutely no force. 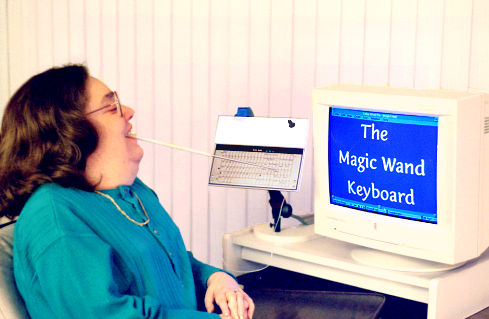 To offer people with disabilities equality in school and on the job, we designed the Magic Wand Keyboard to work easily and instantly, with no training or installation required. Students can do homework independently and up to 3 times faster than before. They can work longer without tiring, take standardized tests exactly like their classmates, do research on the Internet using our built-in, zero-force mouse, and use early-learning educational programs exactly like their friends. Older students will make PowerPoint presentations, complete projects side-by-side with their classmates, and create spreadsheets and CADD drawings without assistance. This miniature keyboard measures just 8.5" x 6.5" x 0.5", with a typing area only 6.5" x 3" (the Mac keyboard is an inch smaller). This enables adults and children with very limited reach to type easily. Designed for simplicity and speed, the keyboard has a full QWERTY layout plus dedicated mouse keys, four programmable keys, keys to speed up one-handed typing, a bell key (for audio feedback), and a special wand key for advanced functions. The built-in mouse requires no strength and very little movement yet it can perform every mouse function just like with any standard mouse or trackball. It works through the keys on the keyboard and has 11 speed settings, left and right click, drag, and double click. 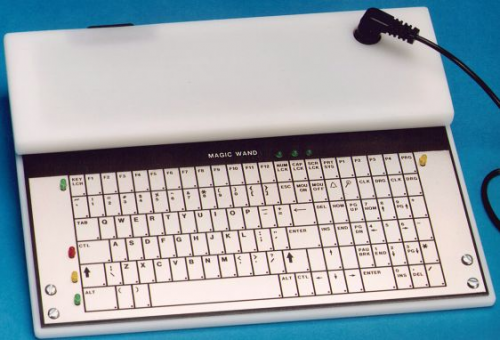 SKU: SEK101 - Advanced Magic Wand Keyboard - Equivalent to a standard 101-key keyboard; with built-in mouse - 8.5" x 6.5" x 0.5"/6.5" x 3"
SKU: SAM33 - Magic Wand Keyboard—Macintosh - Macintosh keyboard; with built-in mouse - 7" x 6" x 0.5"/5.4" x 3"